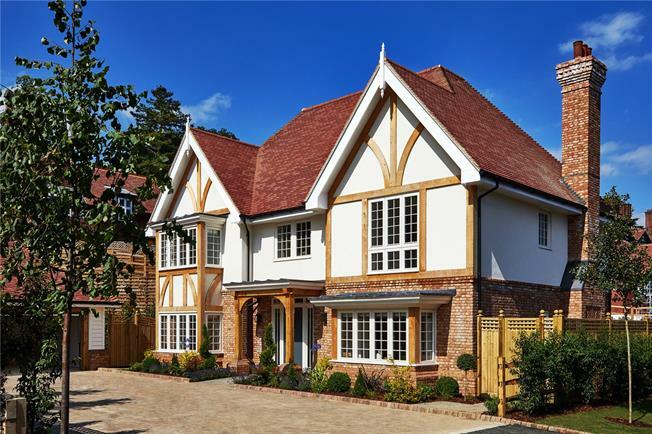 5 Bedroom Detached House For Sale in Wadhurst, East Sussex for Asking Price £1,550,000. The Elder is a beautifully proportioned five bedroom family home. The external specification of tumbled farmhouse brick reflects the heritage style of Sussex homes. The spacious entrance hall leads to the kitchen/dining/living room via double doors whilst the bi-folding doors from the kitchen to the garden allow natural light to flood into the room. The kitchen has integrated Siemens appliances and benefits from a central island. The spacious dining area and family sitting area together with separate utility room make this house perfect for modern day family living. The ground floor also hosts a formal dining room, study, downstairs WC and coat cupboard. The formal sitting room with wood burning stove has French doors leading to the garden. The staircase, with oak handrail and spindles leads to the spacious landing. Upstairs, the master bedroom has double doors leading out onto a large terrace area, whilst the ensuite bathroom benefits from a separate walk in shower and a bath. Bedroom two also benefits from an ensuite shower room. There are three further double bedrooms and a family bathroom. Outside the paved terrace can host outdoor entertaining and the garden is designed with well screened hedging, lawns and landscaped borders.